↑ Zhang Zengxin; Tao Hui; Zhang Qiang; Zhang Jinchi; Forher, Nicola; Hörmann, Georg. 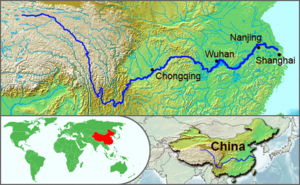 "Moisture budget variations in the Yangtze River Basin, China, and possible associations with large-scale circulation". Stochastic Environmental Research and Risk Assessment 24: 579–589. Retrieved on 2010-07-27. 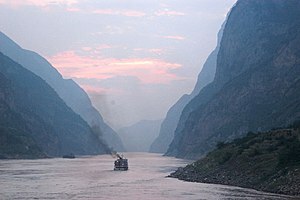 ↑ "Three Gorges Says Yangtze River Flow Surpasses 1998", Bloomberg Businessweek, 2010-07-20. Retrieved on 2010-07-27. This page was last edited on ३० मे २०१४, at १२:३९.